For nearly as long as he can remember, St. Paul's Campbell Smith has been friends with fellow classmate and teammate Holden Smith. Growing up together, the pair became friends in Kindergarten and bonded over a mutual love of football. "His dad was the football coach, my dad was the announcer," Campbell Smith said. "I believe we're fourth cousins. I've never gone through it all, because we're all related. He's basically like a brother to me. We're really close." From playing against each other in modified games of 1-on-1 football in their backyards to football at recess, middle school football and finally high school, the game has been the glue that has held the two teammates, cousins and friends together for more than a dozen years. And while their high school season ended in a heartbreaking loss to Santiam in the state semifinals nearly nine months ago, Campbell and Holden got one more chance to play with each other on Saturday, representing the Buckaroos at the 66th Annual East West Shrine All-Star Football Game. "I know I will coach, but to play one more time, it made me feel pretty good, honestly," Campbell said. "It made the other guys feel good who aren't playing college football. They were like, 'This is awesome that we get to do it one more time.'" 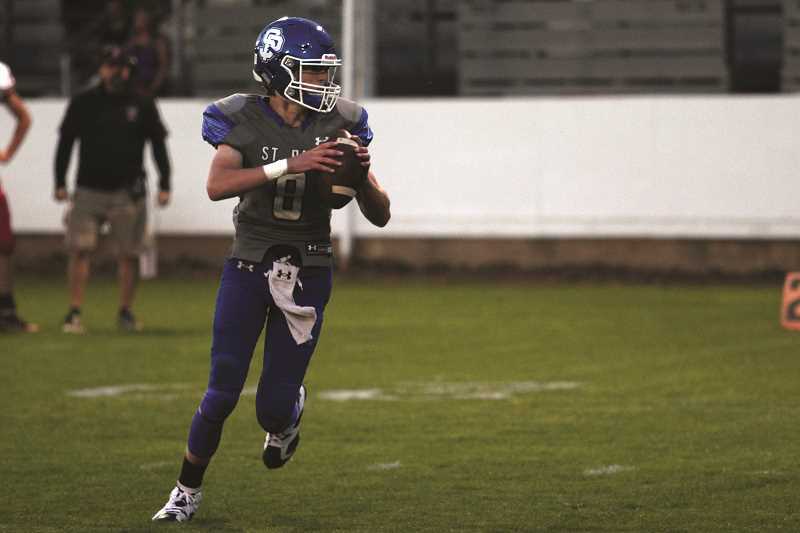 Campbell wasn't expecting to make the trip to Baker City with Holden and head coach Tony Smith, who was serving as offensive coordinator for the West Team. He has been working all summer since graduating in June and got a phone call from an organizer with the Shrine Game the day before players were scheduled to leave. "I was sitting on a tractor and they said, 'Hey, you want to come to the Shrine Game?" Campbell said. "I was like, 'Yeah, sure.' They said, 'Alright, be in Wilsonville tomorrow by 7." The players arrived in Baker City on July 28 and for the next week, spent their time practicing together twice a day and getting to know each other as friends and teammates, rather than as adversaries. ""It was really cool to talk with the guys from the other schools, guys that we used to try to beat," Campbell said. "We go from having a plan to play against this kid, and now we're playing with him." 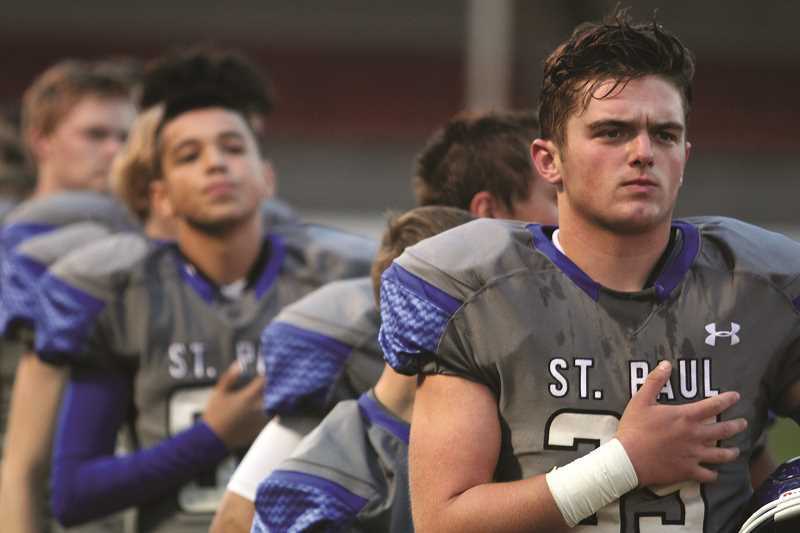 With Coach Smith at the helm of the offense, the West Team ran St. Paul's offense — the Pistol Wing-T. For Campbell and Holden, who had been playing pitch and catch in the offense for the past four years at St. Paul High School, it was a walk in the park. But Campbell admits it can be a difficult system to learn for players not used to that type of offense. "It's a little complex," Campbell said. "It worked at times during the game, but it's hard to run it 100 percent after a week of practice. We had some great plays, we had a couple bad plays, but you know, that happens. It's football." With Holden playing quarterback and Campbell at tight end, the pair helped guide the West's offense. And while the East ended up taking home the victory 20-8, Campbell said the game was more about the experience surrounding the event than the final score. "It's for a great cause, and it was great to meet everybody," Campbell said. "Yeah, we lost, but I'll still remember it as one of the most fun weeks I've had in a long." The game was one last moment for Campbell to enjoy the experience of playing in full pads under the bright lights. A three-sport athlete, Campbell has always put football on a pedestal. It's the sport he fell in love with first, the sport that defined and solidified his friendship with Holden. "St. Paul football is something that I was always built around," Campbell said. "That's always been a part of our relationship – it's Holden and my thing." Baseball came into his life shortly after, while basketball was a late addition. Together, the three sports wove into a rich tapestry of experience that helped Campbell build relationships with his friends, teammates and coaches throughout high school. "It was nothing without the great coaching and the great teammates I had," Campbell said. "It would be nothing without (baseball) Coach Julio (Vela) and Coach Smith, (basketball) Coach (Todd) Swan. Some of my best friends – Brady Weise, Justin Herberger, Holden Smith – those guys just pushed me." But football was always number one. The All-State tight end grew up knowing that his dad had won a state championship with the Bucks, and the legacy of football in St. Paul was something he wanted to continue into high school. When the school district moved up to the 2A Classification in his freshman year, the Bucks gradually went from being a fringe playoff team to one of the best 2A programs in the state this past season. "I always knew that football was a big deal out here," Campbell said. "I always wanted to be great at it. My teammates always wanted to be great at it. We had a great run. Quarterfinals, semifinals. Being a small school in the 2A, that's nothing we should hang our heads about." Although the Bucks ultimately fell short of their goal of bringing another state title to St. Paul this year, Campbell knows that the experience of losing in such dramatic fashion in November will only serve as fuel for the returning players who are ready to take the 1A Classification by storm this fall. "I know the guys who are coming back, they're going to remember that and hopefully it'll make us have a successful season," Campbell said. "It'll be a great season to be a Buckaroo next year."